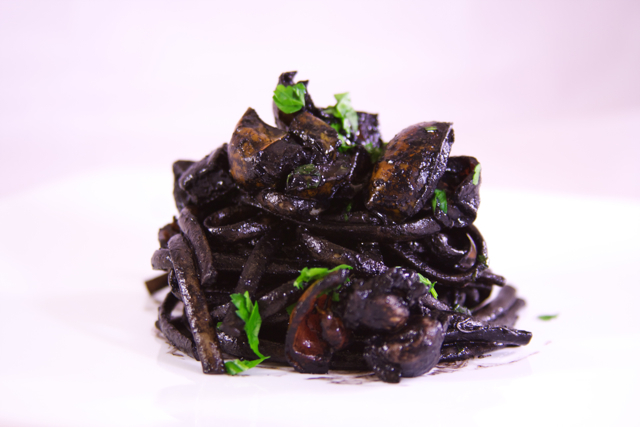 Linguine al nero di seppia, the pasta that takes out the ugly part of everyone. While eating this, we couldn't decide who was the ugliest. With our mouths & teeth completely blackened, it was horrifying for our one-year old to be on the same table with us. She couldn't decide whether to cry or laugh along with our poor attempts to make fun of each other. The poor kid was petrified that her whole family turned into black-mouthed sinister looking characters. 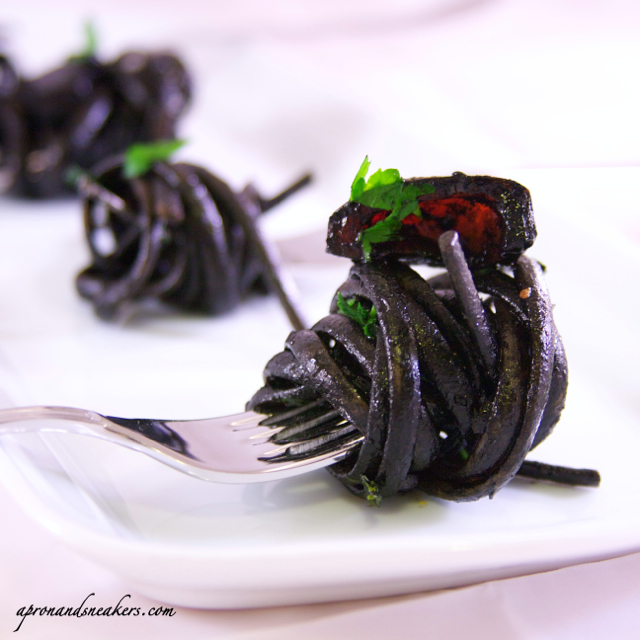 You almost don't find this pasta in the restaurants. I did only once but instead of the classic linguine that goes with it, they mixed it with a kind of short pasta and they also give you a gigantic bib so that you don't dirty your shirt. It's really the dish that you should never eat with someone you are trying to impress. Or actually, the dish that you should eat when you want to ward off someone. 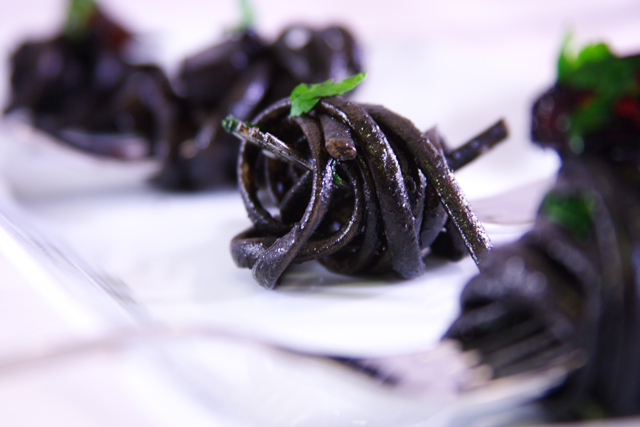 This pasta is a must-try but can be quite a nuisance when preparing and eating because of the black ink. I cleaned the cuttlefish on my own on one or two occasions but I swore I won't clean them again. I broke the ink sacs and I made a black mess. Now our fishmongers do it. If you have to clean them on your own, don't forget to wear disposable gloves and a big apron to cover your clothes. The ink stays in the fingers for some time even after washing frequently. In case you find yourself without the ink, like what happened to me already, don't worry. Continue cooking without the ink. It will still come out delicious. Nowadays, in Italy, you can buy the cuttlefish ink in commercially packed little packages. I usually have one in the refrigerator for emergency cases when I accidentally throw the fresh ink sacs or the fishmonger forgets to include them with the cleaned cuttlefish. Boil water for the pasta. When the water boils, add the salt then the pasta. Follow what is written in the packet for the number of minutes you should cook them. Just remember that the sauce should cook ahead of the pasta, not the other way around. Sautè the garlic & chili in a saucepan with extra virgin olive oil. When the garlic colors, discard them. Add the diced cuttlefish. Cook on medium flame until the liquid is reduced by half. 4. Add the white wine. Put up the fire to high until the alcohol evaporates. Put back to medium and add the quartered tomatoes. Cook for about 15 minutes. Season with salt & pepper. Add the parsley, leaving some for later. 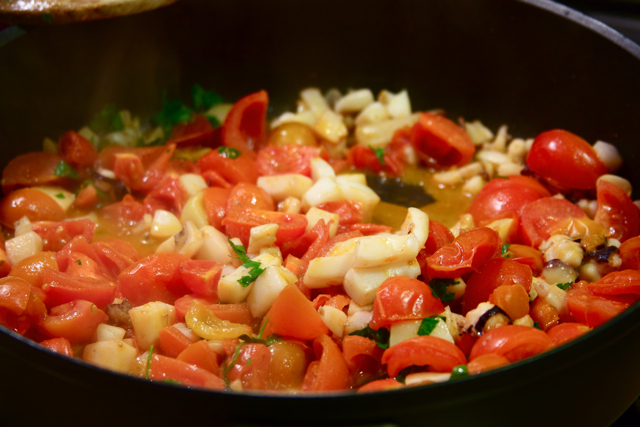 If the sauce becomes too dry, add some water from the pot you are boiling for the pasta. 5. 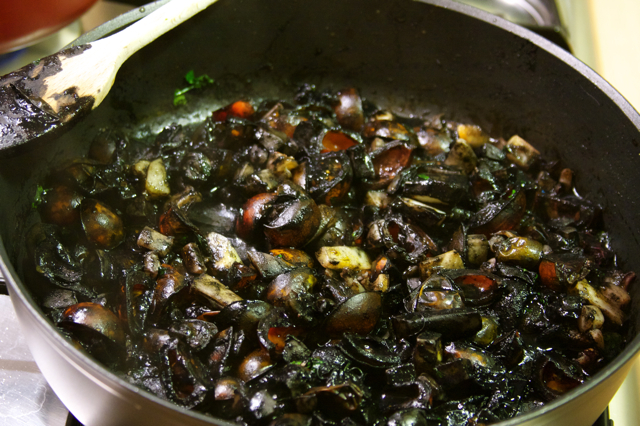 Pierce the ink sacs with a paring knife on top of the saucepan, making the contents fall in the sauce. Discard the sacs when empty. Stir. Cook for another 5 minutes. Add the remaining parsley. Add the cooked pasta. Mix well. Turn off the fire and drizzle with extra virgin olive oil before serving.